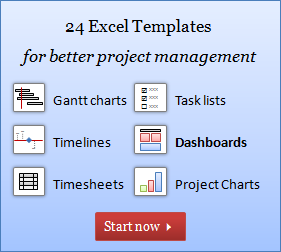 MS Excel continues to play a vital role managing projects. So I made these templates to simplify your life. The templates have been instant hit and helped more than 5,000 project managers around the world to save precious time and effort. You can try them here. 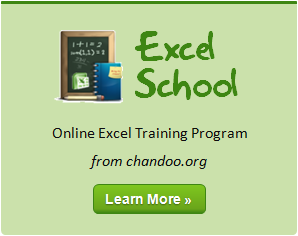 Excel School is my online training program for Excel & Dashboards. We have successfully trained 700 students in first 3 batches. I invite you to join Excel School if you wish to become awesome in Excel. Learn more about Excel School. MS Excel formulas have mystified and puzzled enough people for enough time. I tried to simplify the whole formula learning experience with this fun, small and easy to digest e-book. In this, I explain 75 most important formulas in plain English so that anyone can start using these formulas and get their work done. Please get a copy of the formula ebook here. VLOOKUP & other lookup formulas play a vital role when it comes to data analysis or reporting with Excel. That is why I wrote this book. 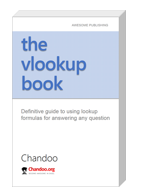 It is a comprehensive guide to help you master VLOOKUP and other lookup functions in Excel. Jon Peltier remains one of the foremost authorities in the world on Excel Charting. I am fortunate to know him and befriend him thru my blog. During last few years, Jon developed a set of excel add-ins to make some of the more difficult charts in Excel. These add-ins can develop charts like waterfall chart, dot plot chart, marimekko chart, clustered-stacked chart etc. Consider getting a copy of these add-ins if your job involves making such charts on regular basis. These add-ins save a great deal of time and effort for you. I have set up a simple bookstore to help you select the right books for learning excel, charting, presentations, story-telling, VBA etc. These are hand-picked books by me or some of the other prominent figures in MS Excel world.